Keep your luggage securely closed during transport, without violating FAA security regulations. The large imprint area will make a big promotional impact, and set your luggage apart from all others! Choice of 1 stock fabric color. Step and repeat 1 PMS color screen print with same imprint on both sides. Size: 36" to 66" adjustable strap to fit most standard luggage. Side release buckle and slide adjuster for easy use. For additional screen printed color, add .18 (A) run charge and 30.00 (G) set-up charge per color. For custom fabric color, add 30.00 (G) set-up charge. For woven imprint, please call for a quote. 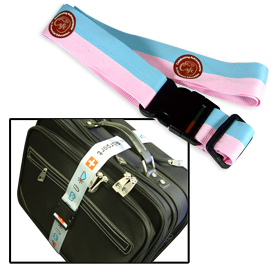 Luggage strap is available in 9 stock colors. For a custom PMS color add $75.00(G) for orders under 1,000 pieces. (No charge for orders of 1,000 pcs. and over). 50.00 (G) plus set-up charge. 50.00 (G) is refundable with order placed. Overnight shipping charges will apply. Adds 2 weeks to delivery. 3 weeks from artwork or sample approval.